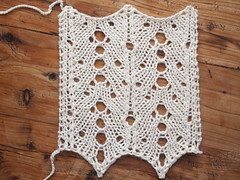 I’ve been enjoying following Sybil R’s blog, Knitting and so on, and seeing the interesting patterns she comes up with (Ravelry page). 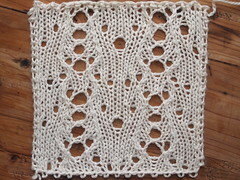 Sybil posted over the weekend about knitting random lace, which is something I’ve been meaning to try for a while. (There’s so many things I want to do! I’ll never run out of things to try, I think.) She links to a tutorial and a book. The funny thing is that I think I once saw a different book on the topic in a secondhand book store, but it didn’t catch my interest at the time. 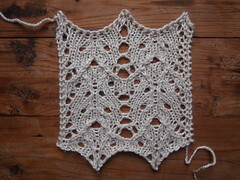 What interests me about random lace is what I suspect it can teach the knitter about how lace structure and design work. Long-tail tubular cast-on (makes a good stretchy edge, good for leading into ribbing and so on). 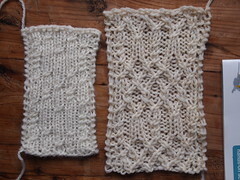 I have been obsessed for the last week with a new knitting tool called Stitch Maps. They’re a new kind of knitting chart that is more like a crochet chart – that is, the stitches aren’t necessarily placed in a grid. Instead, the web app takes written instructions and turns them into a stitch map, in which rows and columns wave and merge in the shapes the stitches take in the actual knitted fabric. Among other things, this eliminates the need for “no stitch” squares in the chart. Go have a look, read the documentation, browse the stitch library, have fun! After looking at enough stitch maps with the column guide feature turned on, I realized that they reminded me of the syntax trees I looked at in my college linguistics classes twenty years ago. This made me wonder what would happen if I tried converting a syntax tree into a stitch map. I decided to use the classic example sentence, Colorless green dreams sleep furiously. (Any English sentence of the form adjective adjective noun verb adverb would produce the same result.) The swatches above show what the actual knitting looks like. The bottom part shows the design with alternating plain rows; the top shows it with pattern stitches on every row. Each version has its charms. Here is the regular chart, chock full of no-stitch squares and looking nothing like the final result. I think both kinds of chart have their virtues; I might start using both for my published patterns. P.S. Remember my knitted Hug stitch pattern? I made it a stitch map. About a year ago I came up with an idea for turning Dewey Decimal library catalog numbers into knitted lace (hi, I’m a geeky librarian. :D). I’m still working on that shawl, but I’ve expanded my thoughts to general encoding of words and numbers into grids, and then knitting. This is a summary of my very long blog posts about this. First, either pick a number you like or turn your words into numbers somehow. You can assign each letter a number from 01-26 (I like to convert mine into base 6 because it tends to make a better pattern) or use the ASCII codes or use some other method. I am particularly pleased by using Dewey Decimal numbers. Then plot those numbers out on a grid. There are several ways of doing this, but the most straightforward is to make the length of one axis the same as the base you’re using (so six squares if you’re using base 6) and the length of the other the same as the number of digits you’re encoding. A five letter word will be 10 digits long in most of the methods I use, so it will fit in a 6×10 grid. Then mark the squares in each row of the grid accordingly. Now you have a grid you can play with layout (be careful if you’re actually using secret code or you’ll make it indecipherable), and then turn the marked squares on the chart into knitting stitch symbols. It’s easiest for colorwork or purl stitches or slipped stitches. 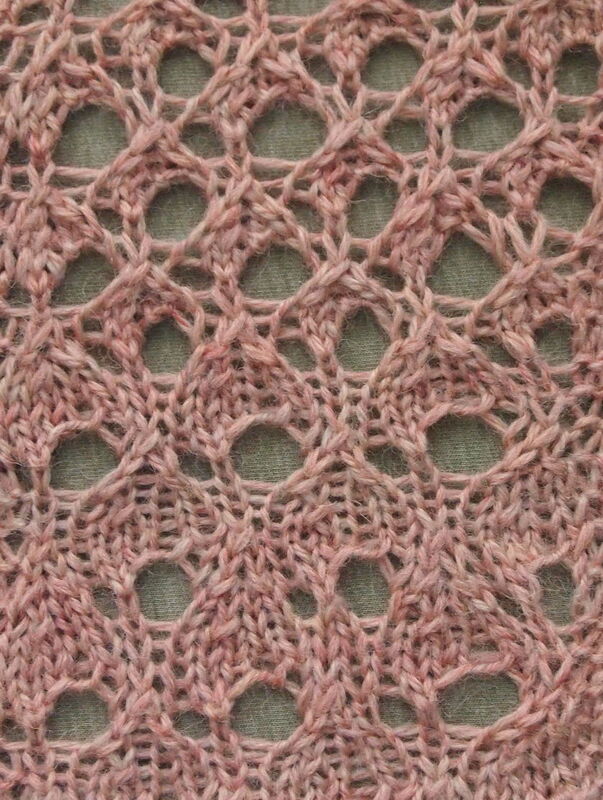 If you’re doing cables or lace, there’s more manipulation you have to do in the background. Now we have come to the end of this series; I have finished describing my method for encoding words and numbers into grids and knitting. I’m going to finish up by summarizing some other techniques, both by other people and myself. I have located two simple ways of knitting a block of text into a cipher that other people have come up with. One is to knit as if you were writing, using purl bumps, colorwork, or slipped stitches. Writing is done in rows; knitting goes back and forth or round and round in rows. Admittedly, the mechanisms are slightly different. However, you can convert letters into binary and then knit the binary code in rows or rounds, where 0 is knit and 1 is purl. Take the word peace. Converted to binary, that’s 01110000 01100101 01100001 01100011 01100101. In knitting, that would be k1, p3, k5, p2, k2, p1, k1, p1, k1, p2, k4, p1. You could go on to write other words as well and end up with a random-looking collection of knits and purls, or you could knit just peace as ribbing with a 40 stitch repeat. Another option would be to convert the words into Morse code and make dots and dashes by purling or using colorwork and leaving gaps in between for the spaces between letters. A dash is three times as long as a dot. Here is peace in Morse code: dot dash dash dot, dot, dot dash, dash dot dash dot, dot. So that would be k1, p1, k1, p3, k1, p3, k1, p1, k3, p1, k3, p1, k1, p3, k3, p3, k1, p1, k1, p3, k1, p1, k3, p1, k1. In fact, since I wrote the first draft of this post, Kate Atherley has published a pattern on Knitty for mittens with a Morse Code stranded knitting pattern. You could even chart out your words using Braille (thanks to Pat Ashforth for this interesting idea). There is also a web page by Wayne Batten which speculates about a potential way that Madame Defarge could have encoded names in her knitting on the fly. The Binary scarf (on Ravelry) by Christine Dumoulin uses colorwork to write binary numbers. Similarly, you could borrow the binary cables from the Binary Cable Hat by Firefairy. Another straightforward method of turning numbers into knitting is to make stripes. Take the word knit. If you use the simplest decimal encoding, then k=11, n=14, i=9, and t=20. Knit 11 rows of one color, 14 of the next, 9 of another color, and 20 of another. Alternately, you could knit ribbing that was k11, p14, k9, and p20. Two anecdotal methods of knitting ciphers from World War II that I haven’t found definite confirmation of and that seem more complicated to use involve modifying the yarn, knitting with it, and then unravelling it when it reaches its destination. In one case, the yarn might have been painted (in a long string, not a skein) with the dots and dashes of Morse code. In the other case, knots might have been tied in the yarn with the space between the knots indicating different letters. Now for some thoughts I haven’t seen elsewhere (though that certainly doesn’t mean these are new ideas). A somewhat more subtle method is to make stripes in both directions on a baby blanket. Here’s a short name for an example: Ed. This becomes 5 and 4. If you do a k5, p4 ribbing for 5 rows and then a p5, k4 ribbing for 4 rows, it makes a reversible check pattern. Another way to make stripes is to pick cable patterns that have stitch repeats that match the numbers. I hope you’ve enjoyed my tour of a variety of methods of embedding and encoding meaning–I’d love to see any projects using my techniques! RT Cross the 2nd st in front of 1st st, knit the 2nd st, then knit the 1st. LT Cross the 2nd st behind the 1st st, knit the 2nd st, then knit the 1st. RT with the back stitch purled. Cross the second stitch in front of the first and knit it; purl the first stitch; take both stitches off needle. LT with the back stitch purled Cross the second stitch behind the first and purl it; knit the first stitch; take both stitches off needle. On the right is the beginning of more complicated playing around. I declared to myself that the coded crosses would mean anywhere that a knit stitch crossed over a knit stitch; otherwise I could place a knit stitch crossing a purl stitch anywhere I pleased, including on return rows. k2tog Knit two together to make a right-leaning decrease. RTssk Slip each of the 1st two stitches knitwise, slip back to left needle. Cross the 3rd st in front and knit it; knit the 1st two stitches together through back loop. If you would rather comment on Ravelry, I’ve posted this to my group as well.